Local MP Dr Caroline Johnson has shown her super-powered support for women with ovarian cancer across Sleaford and North Hykeham at a special event. The event was hosted by the All-Party Parliamentary Group (APPG) on Ovarian Cancer on Wednesday when MPs were given the chance to dress as ‘Teal Heroes’ to raise awareness of the symptoms of ovarian cancer for Ovarian Cancer Awareness Month. Teal is the colour of ovarian cancer awareness, which is said to be alarmingly low in the UK. Data supplied to the APPG shows just one in five women can name bloating as one of the key symptoms of the disease. If you regularly experience any of these symptoms, which are not normal for you, it is important that you see your GP to be checked out. Dr Caroline Johnson MP, said: “Too many women die of ovarian cancer. We all have to act to ensure that more women know the symptoms to look out for, are diagnosed sooner and get the treatment they need. That’s why I was delighted to take part in this year’s Teal Hero event to support women with ovarian cancer and their families. Annwen Jones, Chief Executive of Target Ovarian Cancer, said: “It’s been fantastic to see MPs become awareness superheroes. We all know that much more needs to be done to see the improvements in diagnosis and survival that women with ovarian cancer and their families deserve. Target Ovarian Cancer works to raise the profile of ovarian cancer for early diagnosis. Visit targetovariancancer.org.uk to find out more. 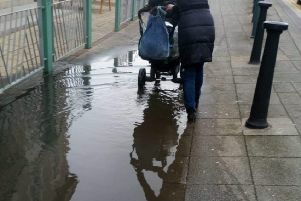 Beware of the giant puddle - council is looking into it!